Whilst my role with bartlett mitchell is diverse, at the core, my responsibility is to infect the business with new and inspiring ideas, exciting food concepts and introduce the world class suppliers I find on my travels. Nothing though, is as important or has such wide-reaching affect as the inspirational cooking days we hold at Trinity teaching the chef team on a monthly basis. Internally, these sessions are labelled as master-classes but I think of them more as inspiration days. We begin with an introduction and discussion around the topics of the day. I like to keep the topics focused on a single area so that we can have meaningful discussions and really focus on one subject of cookery. Past subjects have included dairy; this involved making butter, cheeses, clotted cream, buttermilk and an introduction to the best dairy producer I know. We held a day on vegetable cookery, an area chefs in general often won’t give the love it deserves. It is tricky making vegetables the star of the show, but this session was fantastic and I know the fruits of which you will have seen drip feed throughout the bartlett mitchell stable. I have brought in serious food producers and suppliers to do tastings and one major trip saw a few of us go over to Rungis, the famous food market in Paris. At the last session I encouraged all of the chefs to bring an ingredient that challenges them and I cooked dishes with each item – certainly a challenge for me.. 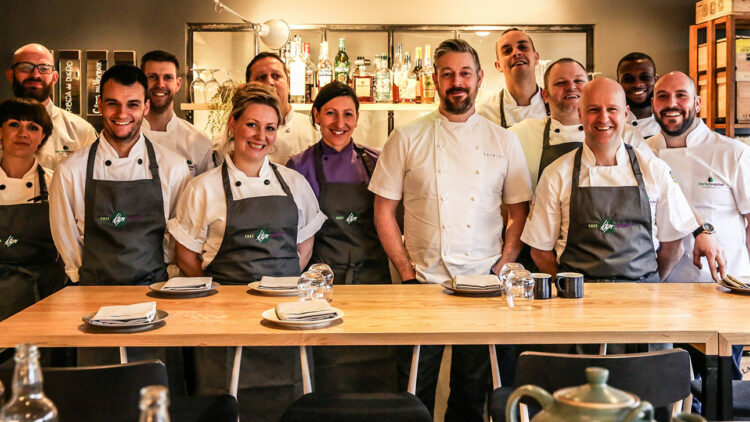 The times we spend together are as much about confidence building as they are inspirational and they are about keeping the bartlett mitchell chef family feeling connected to the forefront of the British cooking scene.